Have you ever been to an Italian restaurant and had fresh pasta? Like many other things, once you try the “real McCoy” – the over-processed, over-priced grocery store dried pasta just doesn’t make the mark. 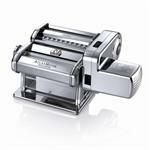 Now you can prepare fresh pasta at home with Italy’s most famous pasta machine, the Marcato Atlas 150mm Pasta Machine. 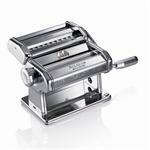 The basic machine comes with one two-sided cutter that makes both spaghetti and fettuccine. The dough is very easy and inexpensive to make. 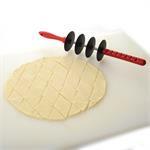 Keep passing the dough through the adjustable rollers until it is the desired thickness. 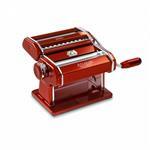 You are now ready to attach a cutter to make the pasta of your choice. 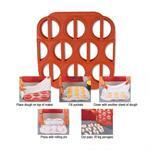 There are a total of ten different pasta configurations. Cuts, forms and seals 18 Big or 24 Little perogies ready to cook or freeze. Use your favourite filling and make them at a fraction of the cost that you would pay in the store. Spaetzle is a German dish of dumplings or tiny noodles made with flour, eggs, water or milk, salt, and sometimes nutmeg. The dough can be made soft enough to be forced through a sieve or colander, or you can do it the easy way and use a spaetzle maker. Meticulous detail and engineering make this Italy's best hand-operated pasta machine. 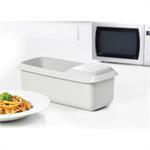 Includes 2 rollers for fettuccine and spaghetti. Use the Spaghetti cutter with the Atlas 150mm pasta machine to make fresh spaghetti pasta (2mm). 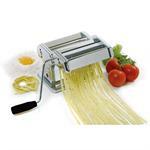 Use the Chitarra cutter with the Atlas 150mm pasta machine to make angel hair. 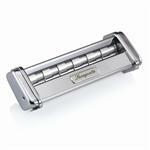 Attach Linguine cutter onto your Atlas 150mm machine to cut 3mm linguine pasta. 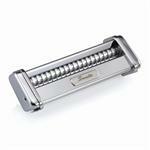 Attach Trenette cutter onto your Atlas 150mm pasta machine to cut 3.5mm straight cut pasta. 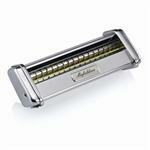 Attach the Malfaldine cutter onto your Atlas 150mm pasta machine to cut 8mm wide wavy-edged pasta. Attach the Reginette cutter onto your Atlas 150mm machine to cut 12mm wide wavy-edged pasta. The Marcato Lasagnette 12mm cutter fits onto the Atlas 150 pasta machine. 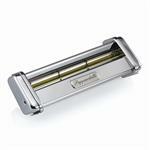 Make fresh lasagna with the Pappardelle 50mm Atlas 150mm attachment. 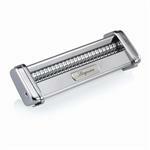 Double pasta cutter comes standard with Atlas 150mm pasta machine. Cuts two styles of pasta: fettuccine (6mm) and spaghetti (2mm).